Without a doubt, portable banners are a great advertising tool for your business; they promote your business or service in a professional and stylish way. Of course, nothing makes your message look worse than when you are using a portable banner that has seen better days and is ragged and torn. It doesn’t matter if your portable banner has been designed to be used indoors at trade fairs, events and conferences, or outside *in the elements* permanently, or semi permanently, advertising your business or service. 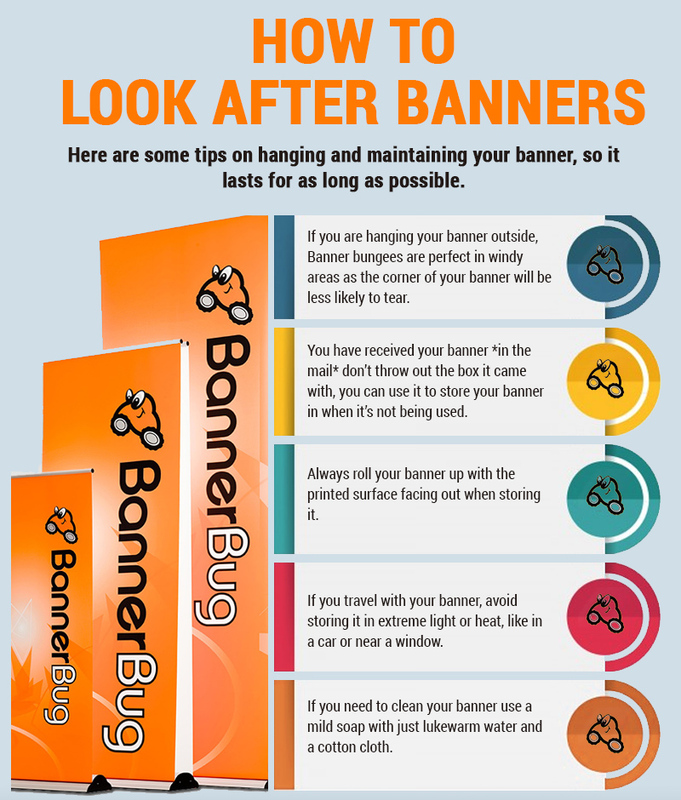 Today we have some tips on hanging and maintaining your banner, so it lasts for as long as possible. When you are hanging your banner outside, you need to use the right materials – this could include using heavy duty cable ties in the corners when you are hanging your banner on a fence – this is important if it will be displayed in a windy area. If you aren’t hanging your banner on a fence – bungee cables or hanging clips are perfect for use around posts or columns. Banner bungees are perfect in windy areas as the corner of your banner will be less likely to tear. If you are hanging your banner inside or on your shop window suction cups are great ways to keep your banner in place. If you plan on the banner being a permanent fixture screw a hook into the wall for each corner and use cable ties or banner hanging clips to keep the banner in place. While you don’t have to worry about your banner being exposed to the elements an alternate is to use a roll up banner stand, this allows you to move your banner around from place to place – great for a showroom. It also avoids damaging the walls and your banner is in the right spot, so it won’t detract from the rest of your displays or area. With just a little extra care and effort you can help keep your banner looking good for longer. If you have received your banner *in the mail* don’t throw out the box it came with, you can use it to store your banner in when it’s not being used. Always roll your banner up with the printed surface facing out when storing it. Never fold your banners up. If you travel with your banner, avoid storing it in extreme light or heat, like in a car or near a window. If you need to clean your banner use a mild soap with just lukewarm water and a cotton cloth. Paper towels can scratch the banner – so never use a brush, steam cleaner, power washer or any other heavy-duty cleaning tools or products on your banner.